I recently participated in a “for real” cookie exchange with some of my blogging buddies. 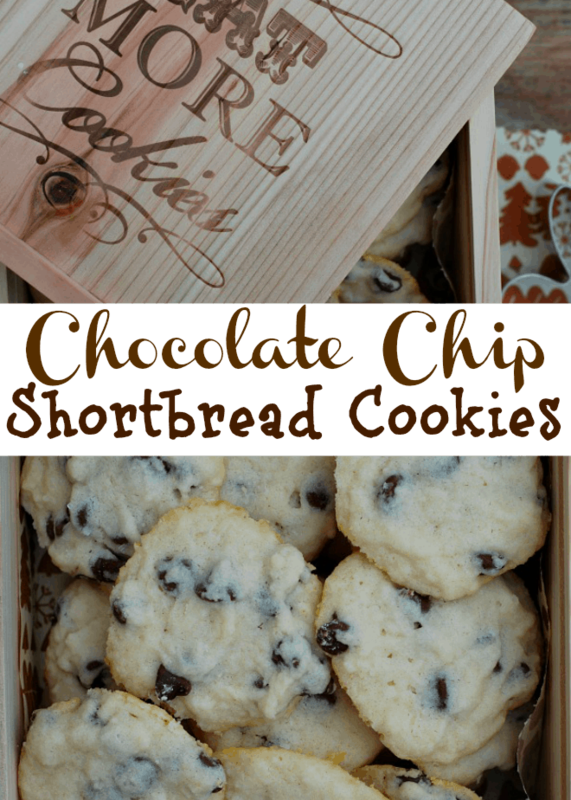 I decided to whip up a batch of my Shortbread Chocolate Chip Cookies. Of course, I couldn’t just stuff some cookies in a tin and call it a day. Since I was mailing them half way across the country, I wanted to make the cookies a little bit special, so here’s what I did. I found the cutest little cookie box at World Market. Then I saw a Moose cookie cutter and knew I had to grab it, too. I wish I had bought one for myself. It’s just too cute. The brown and white parchment paper features owls, trees, and nuts. You can see a little bit in the above pictures. I not only used the parchment paper to line my baking sheets, but I cut a couple of pieces to fit the inside of the box to nestle the cookies. Speaking of cookies – these are one of my favorite cookies. 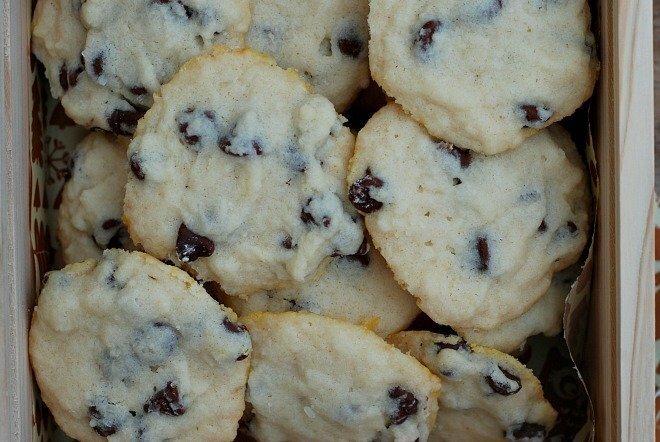 They are buttery bites of chocolate goodness and so easy to make. You’ve got to try them. Preheat oven to 300 and line baking sheets with parchment paper. Scoop tablespoon fulls onto parchment lined baking sheets and flatten slightly. Bake 20-25 minutes or until edges are golden brown. Cool in pan on baking rack for 5 minutes. Transfer cookies to rack and cool completely. 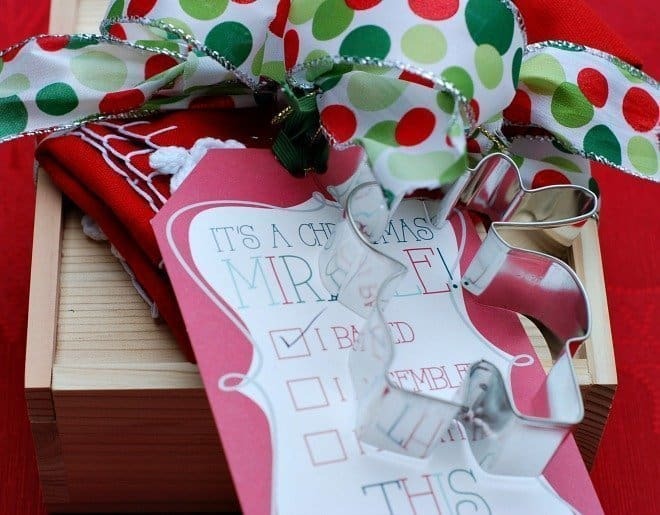 The box of cookies are ready to be shipped, complete with the recipe, cookie cutter and a red and white tea towel all wrapped up in a Christmas bow! I placed the finished product in a sturdy box, surrounded with bubble wrap to ensure the cookies wouldn’t crumble. Have you participated in a holiday cookie exchange this season? You did all that for a cookie exchange??? Lol If there was a prize, I know you would’ve won. 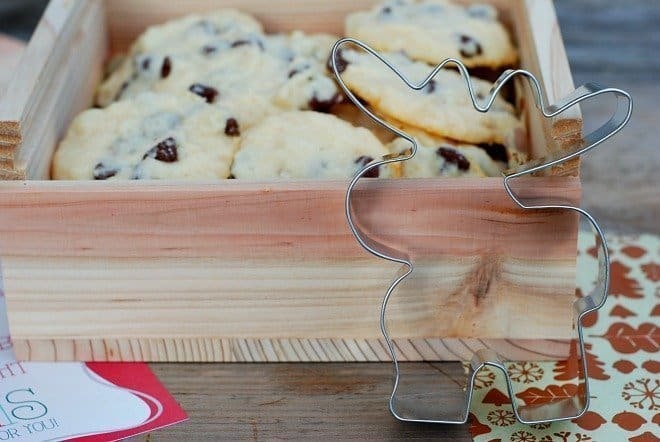 :)I want that box and cookie cutter too. Thanks for the tweet, Tammy and that awesome, FREE blog planner. You’re so sweet. I love the box that you used to package your cookies. Wish there were a World Market in my town! Your cookie recipe sounds wonderful. I love a recipe that taste great and doesn’t have a lot of ingredients. I have to drive an hour to World Market, but then I have to drive an hour to do any major shopping. 🙁 I’m used to be by now. Seems I’m an hour’s drive from everywhere – Charlotte, Columbia, Sumter, Florence . . .
I’ve never done a cookie exchange before, I would love to do this some day. Pinning for sure! World Market always has the GREATEST things. 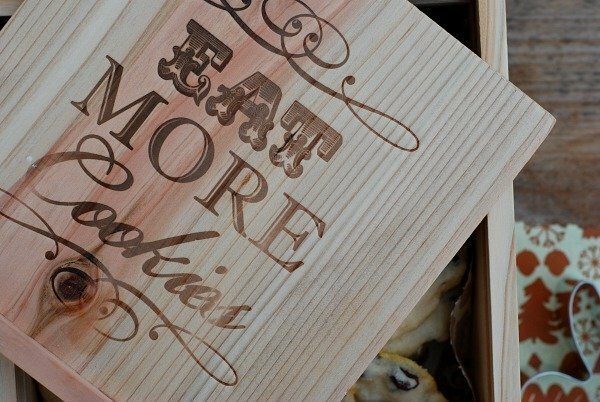 I might swing by and see if I can find some cute cookie boxes like yours – such a great idea for an add-on holiday gift. I know I personally love getting baked goods as presents! OK, seriously I want one of these cookies right now! I can never resist one of your delicious recipes and can’t wait to try this one! I love that box such a nice keepsake. I have only made one chocolate chip cookie that came out decent I am so not good with baking but I want to get better. I’d love to eat these cookies anytime!